Found 14 Publications that match your search (viewing 1 - 14). 11 in. x 17 in. Start Talking. Stop HIV. Hablemos de la Prueba del VIH Poster in Spanish. 11 in. x 17 in. Start Talking. Stop HIV. Hablemos sobre Indetectable Poster in Spanish. 11 in. x 14 in. Start Talking. Stop HIV. Chest Poster. The poster features real men talking with their partners and having the conversations needed to protect their health. Incorporate these posters into community events and educational presentations to stress the importance of open communication about HIV risk and prevention strategies. 11 in. x. 14 in. Start Talking. Stop HIV. Before Play Poster. 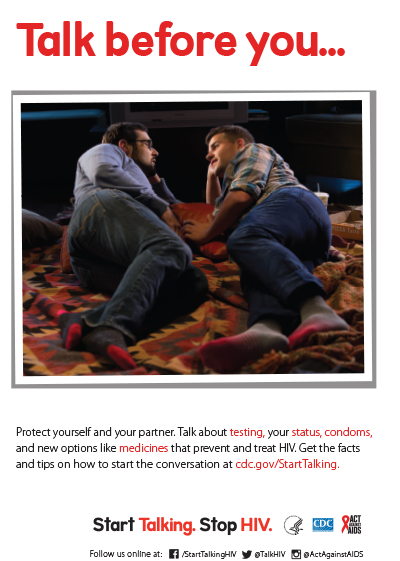 The poster features real men talking with their partners and having the conversations needed to protect their health. Incorporate these posters into community events and educational presentations to stress the importance of open communication about HIV risk and prevention strategies. 11 in. x 14 in. Start Talking. Stop HIV. Before You (Open Shirt) Poster. The poster features real men talking with their partners and having the conversations needed to protect their health. Incorporate these posters into community events and educational presentations to stress the importance of open communication about HIV risk and prevention strategies. 11 in. x 14 in. Start Talking. Stop HIV. Before You (Socks) Poster. The poster features real men talking with their partners and having the conversations needed to protect their health. Incorporate these posters into community events and educational presentations to stress the importance of open communication about HIV risk and prevention strategies. 11 in. x 14 in. Start Talking. Stop HIV. Foreplay (Bar) Poster. 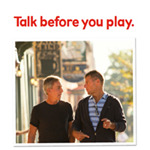 The poster features real men talking with their partners and having the conversations needed to protect their health. Incorporate these posters into community events and educational presentations to stress the importance of open communication about HIV risk and prevention strategies. 11 in. x 14 in. Start Talking. Stop HIV. Foreplay (Text) Poster. The poster features real men talking with their partners and having the conversations needed to protect their health. Incorporate these posters into community events and educational presentations to stress the importance of open communication about HIV risk and prevention strategies. Join the Conversation 8x3 double sided palm card (English and Spanish), featuring gay and bisexual men. Promo 8x3 Double Sided Palm Card. Order campaign materials card highlighting location of STSH materials and contact information. 8x3 Double-Sided English and Spanish palm card. Talk Condoms palm card featuring gay and bisexual men. Start Talking. Stop HIV. Talk Condoms Poster. The poster features real men talking with their partners. 11 in. x 17 in. Start Talking. Stop HIV. únete a la Conversación Poster in Spanish.